A classic British tart containing almond frangipane, a layer of morello cherry jam and decorated with a chocolate feathering through the simple water icing. 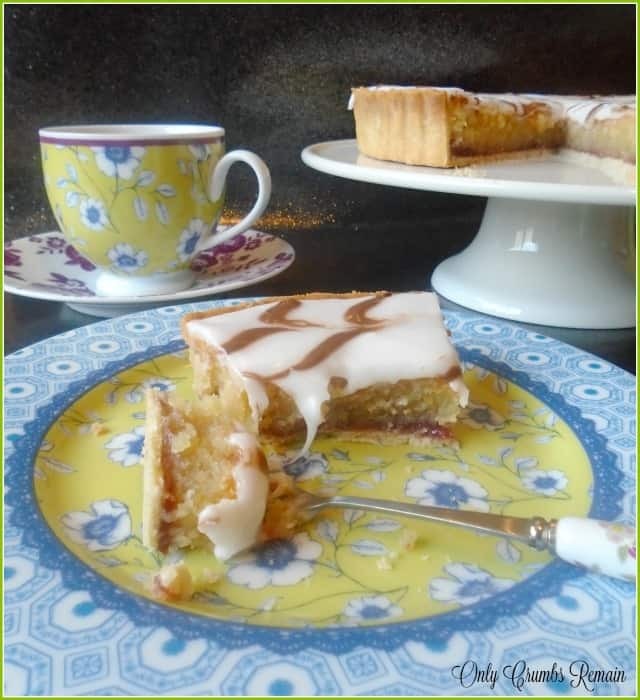 Bakewell Tarts, as Jane from the GBBO’s tent said, are classic and classy. They’ve certainly stood the test of time, and seem to have their origins in the Bakewell Pudding which was first made in the late 18th or early 19th century. Of course, whatever their history, there’s a very good reason for their longevity and put simply it’s because they’re down right delicious. 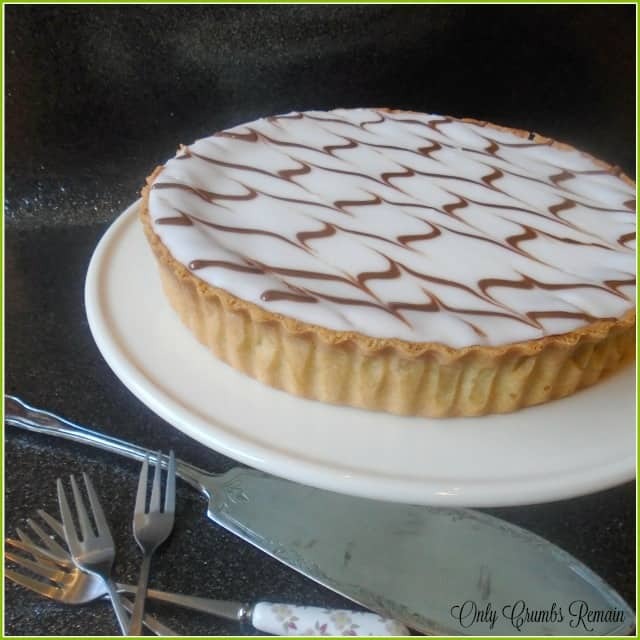 So having watched, like most of the nation, GBBO’s pastry week on Wednesday evening I knew that I wanted to make this classic tart as part of my Blogger’s Bake Along challenge. That said, given my love of pastry, I was also tempted to by the signature Breakfast Pastries (Danish Pastries) and the showstopper filo Amuse Buche too….so watch out for another GBBO pastry related post soon! There are so many ways in which a bakewell tart can be presented. Perhaps as small individual portions rather than a large family sized tart; with different flavoured jam; topped with a scattering of flaked almonds; with a modern zig-zag pattern of water icing; perhaps even finished off with a cherry. Although I did entertain the idea of making a small batch of individual Bakewell Tarts just for Mr E and I to enjoy, I have to admit that I fell under the spell of this classic tart and made a large family sized one which is perfect for sharing. And even though I rang the changes a little regarding the flavours to those which the bakers in the tent used I felt that a larger tart would allow the feathering pattern to sing out. The remaining GBBO bakers were supplied with a pinky-red food colouring which they used to create their feathering pattern, but knowing that such colours are usually (though not exclusively) not vegetarian friendly and therefore not suitable for our household, a melted chocolate was used to create my feathering decoration. Not only did the chocolate feathering negate any vegetarian issues it also brought an extra flavour which worked well with the morello cherry jam and almond frangipane. 1. Make the pastry. 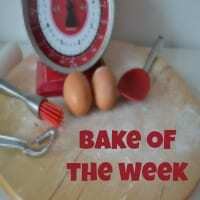 Place the flour, icing sugar and cubed chilled butter into a good sized bowl. Rub the butter into the flour and icing sugar between your thumb and finger tips, until the mixture resembles breadcrumbs. Make a well in the centre of the breadcrumbs and add the beaten egg. Using a rounded pallet knife, or similar, cut through the mixture to make a dough. You may need to add a little cold water to fully bring the mixture together. Tip the dough onto a lightly floured work surface and lightly knead the dough for 10 seconds. Shape the pastry into a ball and flatten into a disc. Wrap in cling film and place into the fridge for at least 30 minutes to chill.2. Line the flan tin. Remove the pastry from the fridge and place onto a lightly floured work surface. Roll the pastry out until it is nice and thin, about 2mm. Wrap the pastry around the rolling pin, lift it up (using the pin) and place into the flan tin. Gently tease the pastry into the case so that it sits into the edges well and picks up the shape of the fluted sides. If the pastry tears, patch it with surplus pastry. If the pastry overhangs the sides of the flan tin excessively, use a pair of clean scissors to trim off some of the excess. Use a fork to gently prick the pastry base. Place into the fridge to chill for about 15 minutes.3. Pre-heat the oven to 190c / 170 fan / Gas 5. Place a flat baking sheet onto the middle shelf which is large enough to house the flan tin.4. Blind bake the pastry. Remove the lined flan tin from the fridge. Cut a sheet of grease proof paper large enough to cover the flan tin. Scrunch it up and open it out. Gently lay it on top of the pastry, easing it into the edges. Weigh the paper down with baking beans or uncooked rice. Place into the oven (on the heated baking tray) and cook for 11 minutes. After 11 minutes, remove it from the oven and place on cooling tray. Use a small sharp knife to carefully trim the excess pastry from the edge of the tart. Place the pastry case back into the oven, with the baking beans/rice and cook for a further 4 minutes. Remove the baking beans / rice and baking paper and cook for a further 5 minutes. Remove the pastry case from the oven and allow to cool on a cooling rack. Keep the baking tray in the oven.5. Reduce the oven temperature to 180c / 160 Fan / Gas 4.6. Make the frangipane. Put the softened butter and sugars into a bowl and beat, with either an electric hand held beater or wooden spoon, until the mixture is pale and fluffy. Add the almond extract to the lightly beaten eggs and mix. Add the eggs to the butter and sugar mixture a third at a time, beating well after each addition. Sieve the ground almonds into the mixture. Fold the almonds in gently using a spatula or large metal spoon. 7. Add the layer of jam. Spoon the jam into a small bowl and stir to slacken. Add half a teaspoon of water if necessary, and mix. Spoon the jam into the cooled pastry case. Use the back of a teaspoon to spread it out to the pastry crust. 8. Fill the pastry flan with the frangipane. Fill a piping bag (no nozzle required) with the frangipane mixture and pipe over the jam (this will prevent the jam from being disturbed). Use another teaspoon to gently smooth out the frangipane. Made a slight indentarion in the centre of the frangipane to prevent the frangipane from doming during the bake.9. Bake the frangipane. Place the flan tin into the oven (on the preheated baking tray) and bake for 30 – 35 minutes. You may need to rotate the tart after 20 minutes of baking. The tart is ready when the sponge is golden brown and a skewer inserted into the centre come out clean. Remove from the oven and set aside to cool for 10-15 minutes in the flan tin. Remove from the tin carefully (perhaps using a cake transfer to lift it off the base) and place it onto a cooling rack to finish cooling.10. Melt the chocolate. Break the chocolate into a glass bowl and suspend it over a pan containing a shallow depth of water, avoiding the bowl touching the bowl. Place over a low heat and allow the chocolate to melt slowly. Stir once the chocolate starts to melt. When only a few small pieces of chocolate remain take the bowl off the heat and set aside. The residual heat will melt the remaining chocolate pieces. 11. Make the water icing. Sift the icing sugar into a bowl. Add a splash of water and stir. Keep adding a dribble of water and stirring until you have a thick icing. 12. Decorate the frangipane tart. Pour the icing over the top of the cold frangipane tart. Use the back of a spoon to gently spread the icing up to the pastry crust. Spoon the melted chocolate into a piping bag (no nozzle required). Cut off the tip of the piping bag. Pipe straight lines over the icing which are parallel and an equal distance to each other. Gently drag a cocktail stick or the back of a small knife at 90 degree (or a 45 degree angle as I did) through the icing and chocolate lines. Notes: a) allow the icing to firm up for at least 30 minutes before slicing into it. Aw thankyou Helen 🙂 I must admit I've never tried a Bakewell Pudding, I shall have to add it to my 'to bake list'! Wow this is beautifully neat! This looks so perfect and so pretty! Love your spin of chocolate on the icing! What beautiful feathering on the top Angela! I really like bakewell tarts but unfortunately my other half is not so keen so I am unlikely to make one. Wish I could just have a slice of this! Thank you Corina. What is it that he doesn't like about Bakewells, is it the almond flavour? If so you could perhaps leave out the extract althogether. To be honest hubby isn't keep on them either and he actually tried a slice and enjoyed it (though he was probably just being polite ;-)! ). 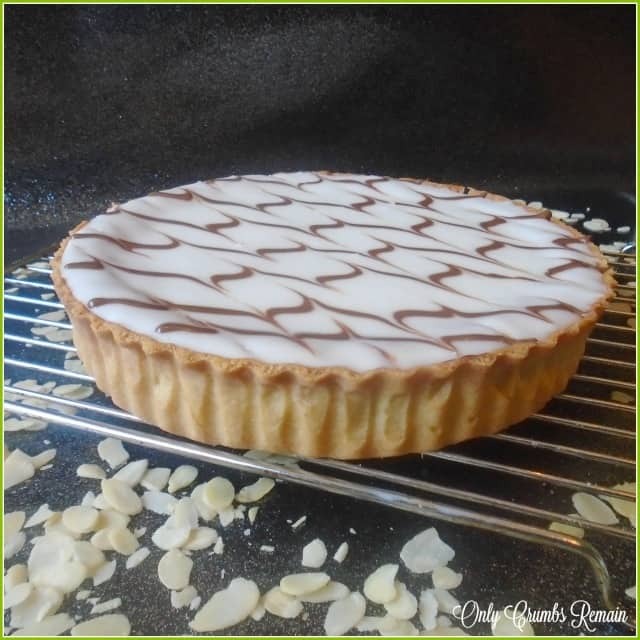 Aw thank you Midge 🙂 Somebody on Instagram mentioned that they'd made a bakewell with aquafaba recently which i'm very intreged about…..I'm really interested to see how it turned out as she's not shared the image as yet. I'm amazed by how many things can be made egg free – there are so many clever bakers out there. Looks amazing Angela. Cherry and almonds are a great combo and a touch of chocolate to finish perfect! Thank you Jacqueline. I totally agree, those flavours work so well together don't they. Wow, what a pretty tart. I love the feathering, it really does look professional and what a good idea to use chocolate, it goes so well with cherry. Pinned for sure! 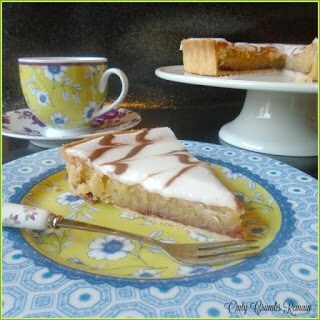 I'm so desperate for a Bakewell tart now, and the idea of cherry and chocolate sounds devine. Your tart looks beautiful. 🙂 Thank you so much Jenny. what a great idea to use chocolate for the feathering (and it looks so neat and professional!) You've done amazingly this week and been so busy with the pastries too – WOW -im totally in awe of you! Aw thank you Rebecca – th chocolate made it a lot easier than hunting for a vegetarian pinky – red food colouring plus it worked nicely with the cherry jam. Yup, I'm feeling a tad wiery now….of for a long sit down with a pot of tea! Honestly my Twitter feed has been chocka block with bakewell tarts and yours is still by far the most perfect one I've seen so far ! Ruddy great job on this! 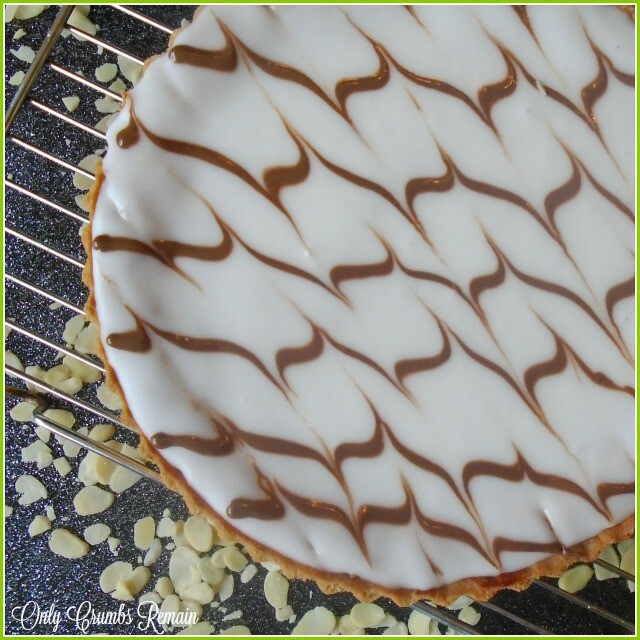 Your tart looks gorgeous – so professional and classy with the zig zag feathering. Look at that lovely, thin, even pastry layer! I couldn't believe how so many of the bakers on Bake Off had never made a bakewell tart and considered it old fashioned. It's a classic! Aw thank you Jo 🙂 I recall James Martin once saying (or perhaps I read his comment somewhere once) that when he works in the pastry section of a pro kitchen the challenge was always to get the pastry as thin as possible and to fill a tart case as much as they could – obviously without any filling overflowing etc. So I try to bear that in mind when I'm rolling my pastry. I know, wasn't it strange, you'd have thought that they would have made a Bakewell at somepoint, there again poor Val said she made them every week and look what happened to her bake! Yum, Angela, looks so professional! What do you make of Bake Off's move to Channel 4? Aw thank you hannah, you're far too kind 🙂 …. but I'll take 'professional' 😉 Ooh don't get me on my soap box about the move to C4 …let's just say that I'm not a happy bunny about it all!